Can a football boot help you with agility? We laced up in the Nemeziz to find out. Big disclaimer: I hated the first generation adidas Nemeziz, the 17.1. I thought it looked cool though, with the agility bandages and the black, white and yellow colourway. I liked the idea of a boot which had these elastic bandages that gave you superior lockdown but yet had the stretching ability to accommodating hard lateral movements your feet that to make in a game. It was made for the agile, mazy dribbler who was constantly on his toes and had a quick change of pace and direction. It was no surprise that adidas had Messi and Firmino be the face of the Nemeziz line. But upon trying the Nemeziz 17.1, the boot did not meet expectations. It was hard to put on – quite common for one piece upper boots. What really disappointed me was how stiff and plasticky the upper was. All this talk of agility and bandages went down the drain as I had one of the stiffest boots on feet. I expected an upper that was made out of the bandage material with minimal plastic coating but what I got was a coating that was too thick and hard. I was a little hesitant when adidas sent me a set of the new Nemeziz 18.1 and they had a mountain to climb to convince me to enjoy my game in these. 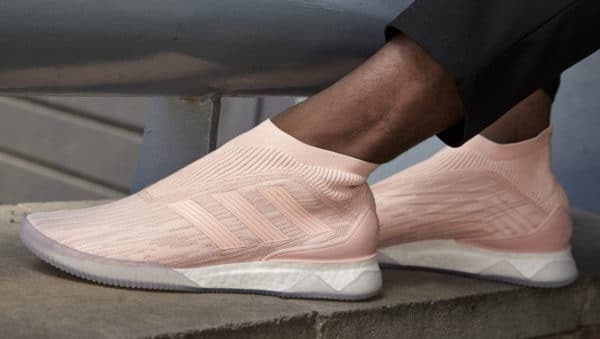 What’s New in The adidas Nemeziz 18.1? On the surface, it looks not too dissimilar to the previous generation 17.1s. The boot features the signature “agility bandages” design which wraps across the upper that gives it the tight lockdown and support when cutting laterally. The V-shaped collar around the ankle is still present which is a nice touch. However, gone is the thick plastic coating which has been the bane of my existence! The coating is much thinner, paper thin. The plastic coating from the 17.1s had small dots all around it to help with friction in contact with the ball. The agility bandage on the Nemeziz 18.1 is much smoother to the touch. There is the textured zig zag design on the material but it’s not coarse enough to provide sufficient grip on the ball. The upper does feel softer, padded and strangely, quite thick and foamy. After slipping on the boot, it immediately hit me how tight and narrow the boot was around the mid-foot. I have moderately wide feet and my feet were calling out for help from the moment it settled in the Nemeziz. I really started liking the Nemeziz. The tight fit didn’t feel so restrictive any more. Running around in them wasn’t painful and it did feel quite responsive when I had to make quick cuts and sprints. 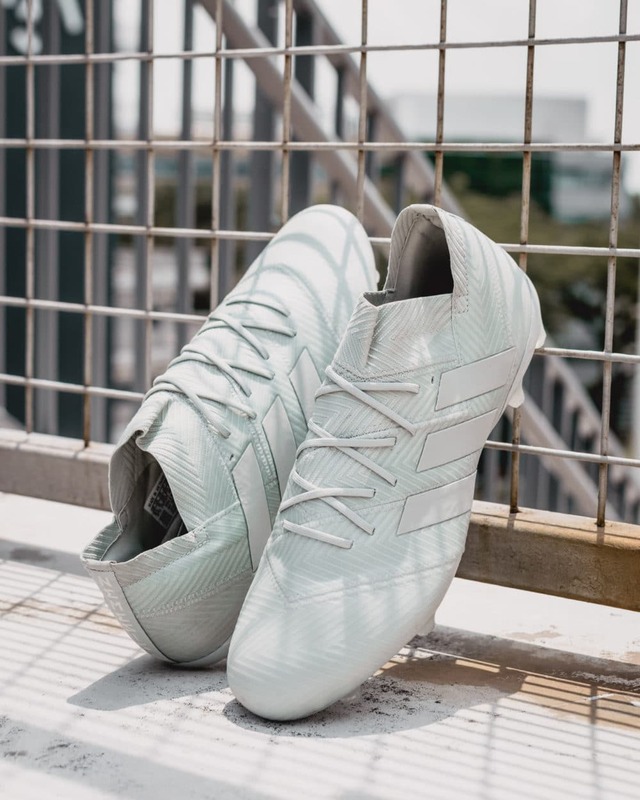 Lockdown was never an issue and adidas has managed to finally achieve what it intended to do with this element of the boot. It holds the feet in place even more so than the impressive X18.1. While I wouldn’t recommend removing the laces, the way this boot is constructed does seem like it could operate just as well if you removed them. What took me by surprise was how padded the upper was. I was not expecting a boot of this type to have a foamy, padded sensation. Boots made for dribblers and attackers usually provide a bare foot feel but the Nemeziz 18.1’s is surprisingly well padded, even thicker than the adidas Predator 18.1. Passing, receiving and striking the ball does have a comfortable pillowy sensation to it. adidas even included cushioned pods around the heel area though they’re not as thick and plush as the ones in the X18.1. I liked that the whole inner lining of the boot featured a synthetic suede material which made me feel cocooned in velvet drapes. After one half of football, I felt that the boots were broken in. I could have gone for another half in the Nemeziz – that’s how much I came to enjoy playing in them. However, I think the upper would be a possible deal breaker for some players. For many who associate themselves as dribblers and tricksters, they like the bare foot feel to really have a close touch with the ball. You’re not going to get it here with the Nemeziz and you’ll be better off with the X18.1 or even the Predator 18.1 if that’s your thing. adidas has done it again with this soleplate. Well technically, that’s cheating as all their soleplates are identical except for the stud pattern but don’t let it detract from the fact that it still works very well on both FG and AG. I still can’t wrap my head around how it doesn’t bring about any discomfort despite looking like a full FG formation. 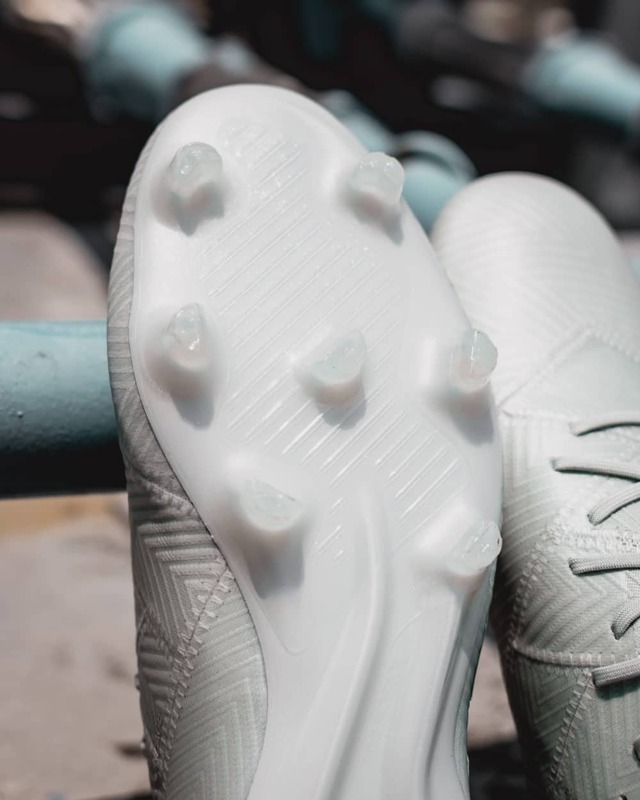 The Nemeziz’s studs form a semi circle shape which brings the best of both rounded conical studs and bladed ones. I have no real issues wearing this on FG and wouldn’t mind more rounds on it. 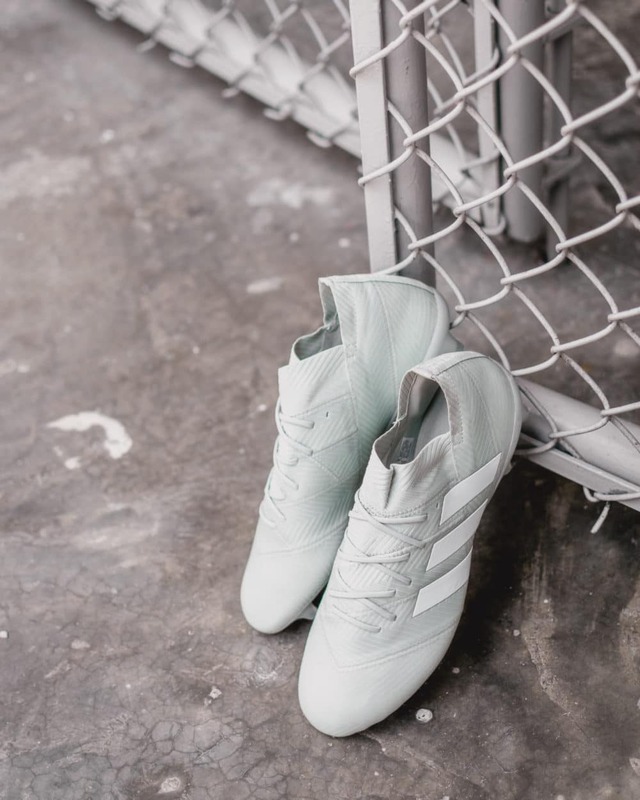 The current Spectral Mode pack has come under public acclaim for a very unique pastel colourway that hasn’t been seen in the industry. While many are raving about the pink Predators, I have come to like the small touches on this Nemeziz 18.1. 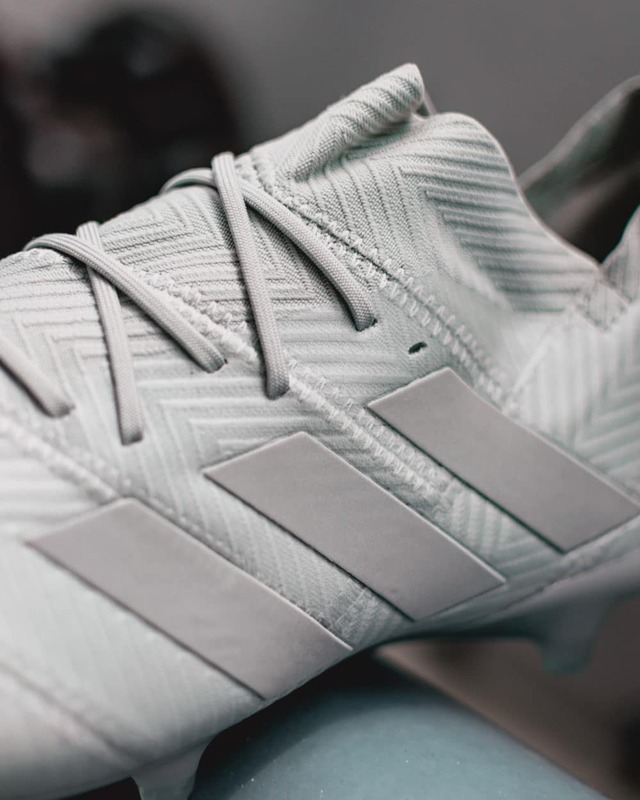 In person, you’ll notice that the Nemeziz has a slightly green tint to the primarily grey base. Kind of like some brands of toothpaste, to put it crudely. The soleplate features a slightly glittery effect to it and in the dark, the 3 stripes on the boot do provide a reflective effect to the eye. Very nice, subtle touches on what I think is a candidate for best colourway of the year. The Nemeziz 18.1 is a major improvement on the previous iteration. It is softer, more comfortable and still maintains its main strength – superior lockdown. I’ve always liked how the boot looks like and the Spectral Mode colourway adds some nice touches to it that makes me like it even more. The soleplate works and doesn’t leave me worried about injury or discomfort. I’ve also noticed that with the 2 most recent boot launches, the X and the Nemeziz, the boots break in extremely easily. Kudos to adidas on managing this and I am keen to see if the next Predator and Copa can turn buttery soft from the get go. The Nemeziz is a good boot and I’m a convert. That said, I can’t help but feel like I personally would still prefer to rock the X18.1s if I wanted a boot that makes be feel locked in as a dribbler/attacker. If I wanted a plush upper, I would switch to a leather boot. 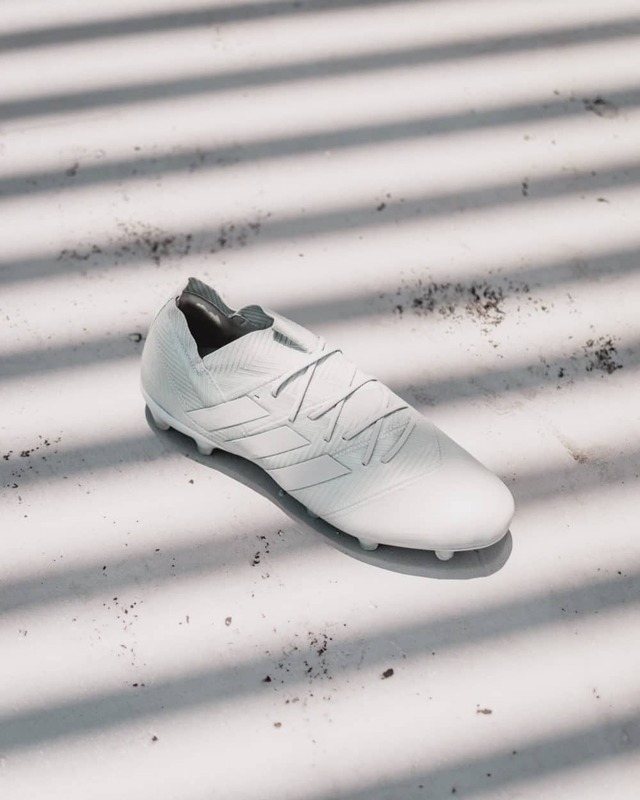 The Nemeziz is caught between both worlds where it may not be the first choice for those who wants the responsive lock down of a speed boot or for someone who wants a thicker, padded upper. But if you’re in that niche category who wants a bit of both, this one’s for you. A surprisingly good boot if you love a superior lockdown and a plush, padded upper. Thick upper for a "speed boot"